Familylane: Are we Happy in our life or are we happy about our life? Are we Happy in our life or are we happy about our life? I had mentioned in another post the following; "Happiness is perhaps an ultimate aim of everyone on this earth. It has become a state that is hard today to have a singular definition or description of happiness as it varies from one individual to another which also varies from culture to culture. The variety includes the state of a person's economic well being, joy in relationships, accomplishments and even a sense of purpose that is larger than one's own life perhaps. The human mind is being studied in advanced countries to help more people achieve what is called authentic happiness." I asked an open question in facebook not too long ago, "Are you happy in your life or happy about your life?" From the little feedback received, I realized not many really understood the difference in the way the two statements are constructed as they sound almost similar and yet there is a subtle difference. 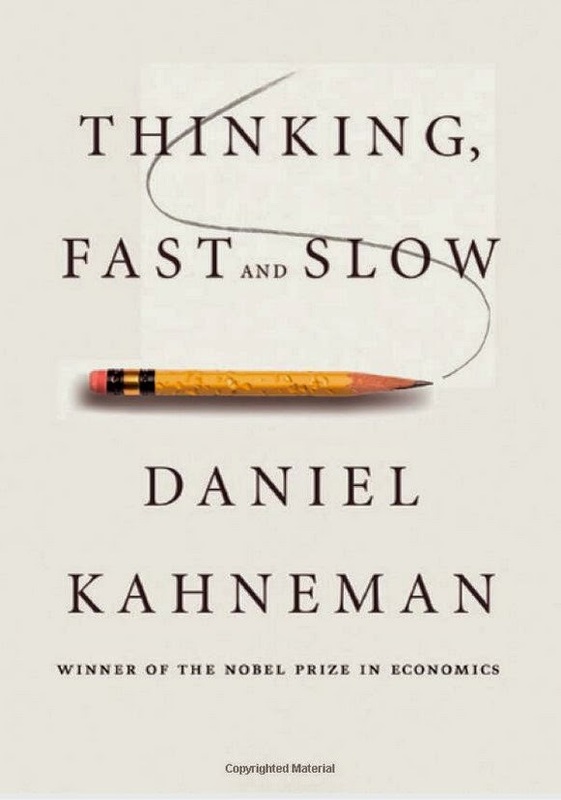 As pointed out by Daniel Kahneman, a Nobel prize winner in economics and the author of the book THINKING, FAST and SLOW, one is based on our memory of what happens in our life and the other is based on a summary we call our experience in life. You can watch a video of his talk found here. I enjoy keeping up with cutting edge technology in reading the latest scientific books and using latest released technology almost as much as reading spiritual books based on latter-day revelations and applying each day's spiritual inspiration from God! Each knowledge adds on to the fullness of Man thus fulfilling what I believe to be a major purpose for us to be born and to live on this earth. Learning has become a great source of happiness to me and I've spent a lot of time documenting memories of my life filled with rich experiences! I've always been interested in Thinking and reading Daniel Kahneman's work has helped me gain further understanding of the working of our brain over and above the basic knowledge that I've learned. I had learned from the book that social scientists in the 1970s broadly accepted two ideas about human nature. First, people are generally rational, and their thinking is normally sound. Second, emotions such as fear, affection, and hatred explain most of the occasions on which people depart from rationality. That was what I had believed too, always blaming emotions to my irrational acts. The work of the author challenged the two assumptions or ideas above without discussing them directly. Instead, he and his partner Amos had documented systematic errors in the thinking of normal people and traced the errors to the design of the machinery of cognition rather than to the corruption of thought by emotion! In the words of the author, "...they used resemblance as a simplifying heuristic (roughly, a rule of thumb) to make a difficult judgment. The reliance on the heuristic caused predictable biases (systematic errors) in their predictions." This is usually done by ignoring the relevant statistical facts and relied exclusively on resemblance. How many people do you know who are truly happy in their life? Earlier in the year, I was invited to the 80th Birthday of my "Ah Chik" or uncle on my grandmother's side. Now here is a happy man that I've known since as a young boy visiting my grandmother's home in Penang almost yearly during the year-end school holidays. 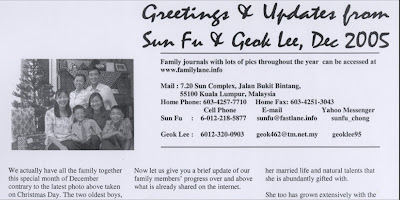 Life on the island of Penang in the early days where my parents were born also was never easy. There weren't enough jobs for men as the state didn't have much economic development compared to the major cities like Kuala Lumpur where I was born. I'm impressed with the good number of friends and family members that attended his birthday dinner. More photos of the occasion can be found in a blog post here. 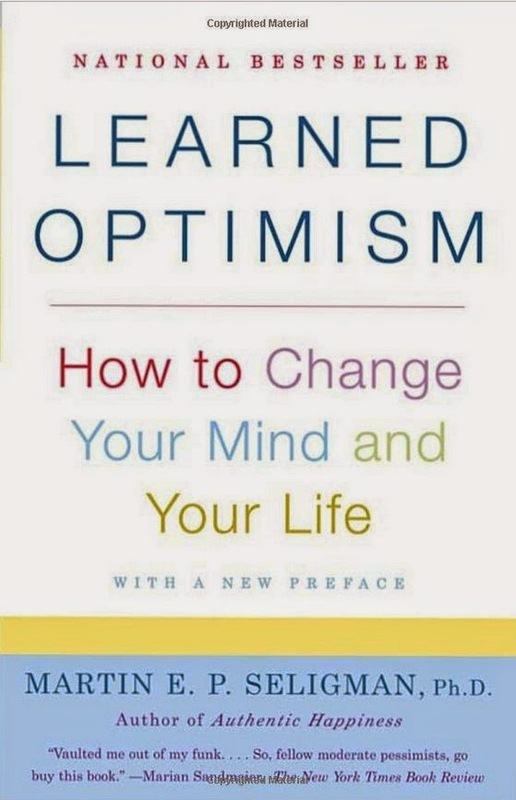 One of my favorite books that impressed me in the early years of my management consulting profession is the book above published in the year 1991 that has a simple questionnaire that I have tested on many people to accurately determine if they are an Optimist or a Pessimist. I still use the questionnaire today so if anyone is interested to do it, send a request to admin@fastlane.info and the questionnaire will be sent to you. PERMA: Positive emotion, Engagement, Relationships, Meaning, and Accomplishment (or PERMA). 1. Regardless of what I am doing, time passes very quickly. 2. My life serves a higher purpose. 3. Life is too short to postpone the pleasures it can provide. 4. I seek out situations that challenge my skills and abilities. 5. In choosing what to do, I always take into account whether it will benefit other people. 6. Whether at work or play, I am usually "in a zone" and not conscious of myself. 7. I am always very absorbed in what I do. 8. I go out of my way to feel euphoric. 9. In choosing what to do, I always take into account whether I can lose myself in it. 10. I am rarely distracted by what is going on around me. 11. I have a responsibility to make the world a better place. 12. My life has a lasting meaning. 13. In choosing what to do, I always take into account whether it will be pleasurable. 14. What I do matters to society. 15. I agree with this statement: "Life is short eat dessert first." 16. I love to do things that excite my senses. 17. I have spent a lot of time thinking about what life means and how I fit into its big picture. 18. For me, the good life is the pleasurable life. 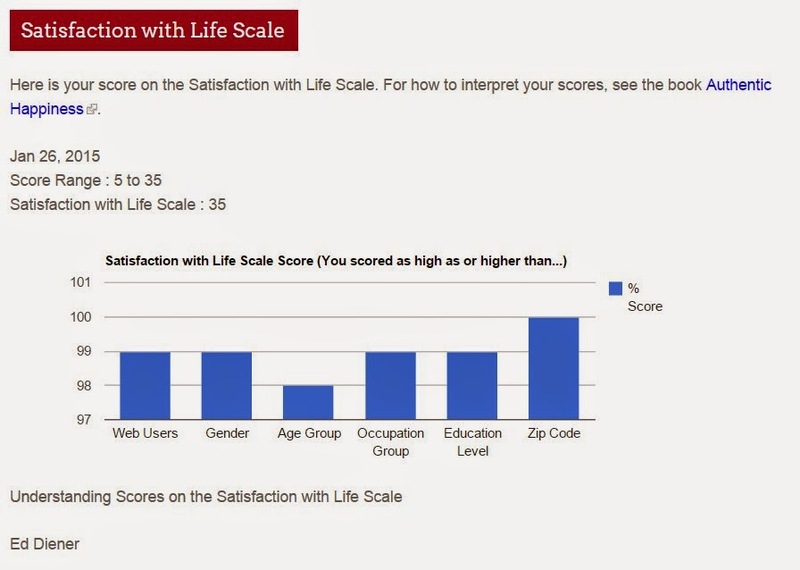 Higher scores on the Good Life (knowing what your signature strengths are, and then recrafting your work, love, friendship, leisure and parenting to use those strengths to have more flow in life) and the Meaningful Life (using your signature strengths in the service of something that you believe is larger than you are) have been shown to lead to greater satisfaction with life. 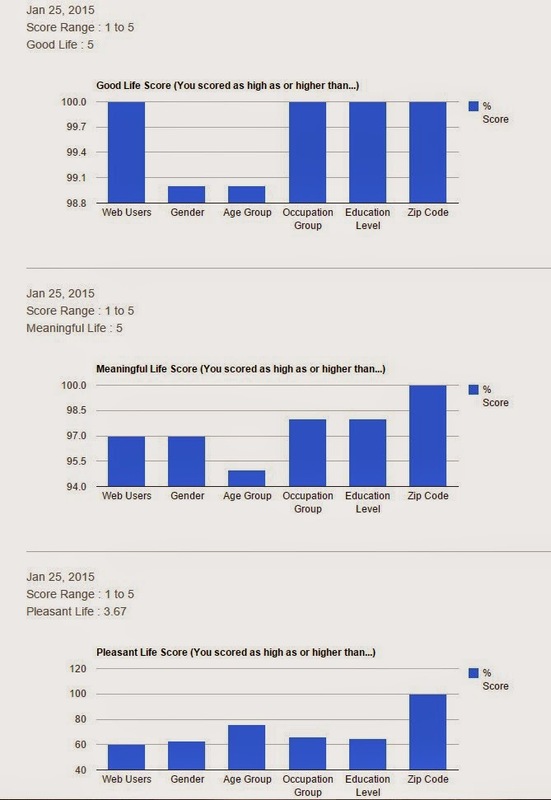 Higher scores on the Pleasant Life (having as many pleasures as possible and having the savoring and mindfulness skills to amplify the pleasures) don't add to satisfaction. To measure your satisfaction, use the Satisfaction with Life Scale. 3. I am completely satisfied with my life. 4. So far I have gotten the most important things I want in life. 5. If I could live my life over, I would change nothing. I chose 'Strongly agree' for all my responses for the 5 statements above. Wow, when I read the above, I was elated to realize that when I just started this post to name my favorite 2 books and authors in the field of the mind or psychology last Oct 2014, I had stopped as I needed to catch up with the latest work of Martin Seligman but was too busy till now in Jan 2015 to continue. Here I am doing his questionnaires live online and recording the results in this post to learn of the man Ed Diener who has worked with my two favorite researchers also! I must attribute this coincidence to some common frequency that I had got attracted to in the work of all these 3 men on the topic of Happiness that I was also researching in my own small way. People who score in this range love their lives and feel that things are going very well. Your life is not perfect, but you feel it is about as good as life gets. Furthermore, just because you are satisfied does not mean you are complacent. In fact, growth and challenge might be part of the reason you are satisfied. For most people in this high-scoring range, life is enjoyable, and the major domains of life are going well – work or school, family, friends, leisure, and personal development. People who score in this range like their lives and feel that things are going well. Of course, your life is not perfect, but you feel that things are mostly good. Furthermore, just because you are satisfied does not mean you are complacent. In fact, growth and challenge might be part of the reason you are satisfied. For most people in this high-scoring range, life is enjoyable, and the major domains of life are going well – work or school, family, friends, leisure, and personal development. You can draw motivation from those areas of your life that you are dissatisfied with. You have an average score. The average of life satisfaction in economically developed nations is in this range – the majority of people are generally satisfied but have some areas where they very much would like some improvement. Some people score in this range because they are mostly satisfied with most areas of their lives but see the need for some improvement in each area. Other people score in this range because they are satisfied with most domains of their lives, but have one or two areas where they would like to see large improvements. Generally, people who score in this range have areas of their lives that need improvement, but would usually like to move to a higher level by making some life changes. People who score in this range usually have small but significant problems in several areas of their lives or have many areas that are doing fine but one area that represents a substantial problem for them. If you have moved temporarily into this level of life satisfaction from a higher level because of some recent event, things will usually improve over time and satisfaction will generally move back up. On the other hand, if you are continually slightly dissatisfied with many areas of life, some changes might be in order. Sometimes we are simply expecting too much, and sometimes life changes are needed. Thus, although temporary dissatisfaction is common and normal, a continual level of dissatisfaction across a number of areas of life calls for reflection. Some people can gain motivation from a small level of dissatisfaction, but often dissatisfaction across a number of life domains is a distraction, and unpleasant as well. People who score in this range are substantially dissatisfied with their lives. People in this range may have a number of areas that are not going well or one or two areas that are going very badly. If life dissatisfaction is a response to a recent event such as bereavement, divorce, or a significant problem at work, you will probably return over time to his or her former level of higher satisfaction. However, if low levels of life satisfaction have been persisting for some time then some changes might be in order – both in attitudes and patterns of thinking and probably in life activities as well. Low levels of life satisfaction in this range, if they persist, can indicate that things are going badly and life alterations are needed. Furthermore, a person with low life satisfaction in this range is sometimes not functioning well because their unhappiness serves as a distraction. Talking to a friend, a member of the clergy, a counselor, or another specialist can often help to get moving in the right direction, although positive change will be up to you. People who score in this range are usually extremely unhappy with their current life. In some cases, this is in reaction to some recent bad event such as the death of a loved one or unemployment. The dissatisfaction can be a response to a continuing problem, such as alcoholism or addiction. In other cases, the extreme dissatisfaction is a reaction due to something bad in life such as recently having lost a loved one. However, dissatisfaction at this level is often due to dissatisfaction in multiple areas of life. Whatever the reason for the low level of life satisfaction, it may be that the help of others is needed – a friend or family member, counseling with a member of the clergy, or help from a psychologist or other counselor. If the dissatisfaction persists, you need to change, and often others can help. Talk to your GP or contact a mental health organization. For those interested to do the free tests by way of answering questionnaires which will give you good feedback about yourself, Visit the site of Authentic Happiness questionnaire center by clicking here. Some things I've learned about the work of Martin Seligman on 'Happiness' as well as a better understanding of the world of Psychology. I learned that the author had declared a change in his original theory of 'Happiness' from the time of publishing 'Authentic Happiness' in 2001 to the time he came out with his new book 'Flourish' in 2011. I researched to find that he wrote a long statement explaining this change from using Happiness to Well Being as a better term under the umbrella of Positive Psychology. You can read this in Source 1 and Source 2 webpages. In a couple of videos I reviewed, I recall he has mentioned that the change is likened to changes required in the field of technology that has become an expected occurrence in our modern day world. I began to research more to find out how is psychology perceived in the scientific world. I first came across this document of the writings about Sigmund Koch with this opening statement, "The 19th-century belief that psychology can be an integral discipline, which led to its institutionalization as an independent science, has been disconfirmed on every day of the 112 years since its presumptive founding. When the details of that history are attended to, the patent tendency has been toward theoretical and substantial fractionation (and increasing insularity among the “specialties”), not toward integration. Moreover, there are many principled considerations that underline the futility of seeking theoretical, conceptual or even paradigmatic unification. Sigmund Koch was one of the premier scholars of psychology, completing his Ph.D. in Psychology at Duke University in 1942. Koch remained at the institution, initially as an assistant professor and later as a full professor until 1964. He was also a full professor in 1967 at the University of Texas at Austin, moving to Boston University in 1971. He continued to hold his post at Boston until his death in 1996. During his tenures in Texas and Boston, he was also elected as President of several divisions in the American Psychological Society(APA). In his distinguished career in the academic world, Koch was certainly well aware of the rules of the scientific world to determine what can be classified as a branch of Science or not. In a Los Angeles Times article of July 13, 2012, entitled, 'Why Psychology isn't science' by Alex B. Berezow, it was published that the reason is psychology often does not meet the five basic requirements for a field to be considered scientifically rigorous: clearly defined terminology, quantifiability, highly controlled experimental conditions, reproducibility and, finally, predictability and testability. As I watch several videos of Martin Seligman, a man who also has a distinguished career in the academic world, I could detect that he spoke like a typical professor to emphasize scientific practice being used in his department's studies that are 'quantifiable' or 'highly controlled experimental conditions' etc. and would often use specific figures or statistics to show that well being could be most important 'measurable' or 'quantifiable.' In the above 2012 video, I heard a scientific or mathematical term he used that I couldn't understand called the 'Losada Ratio' which he talked quite a bit about it. So I googled the term and found that the critical positivity ratio (also known as the Losada ratio or the Losada line) is a largely a discredited concept in positive psychology positing an exact ratio of positive to negative emotions which distinguishes "flourishing" people from "languishing" people. The mistake was not by Martin Seligman as the ratio was proposed by Marcial Losada and psychologist Barbara Fredrickson, who identified a ratio of positive to negative affect of exactly 2.9013 as separating flourishing from languishing individuals in a 2005 paper in American Psychologist. It was widely embraced by both academic psychologists and the lay public; Fredrickson and Losada's paper was cited nearly 1,000 times, and Fredrickson wrote a popular book expounding the concept of "the 3-to-1 ratio that will change your life". In 2013, the critical positivity ratio aroused the skepticism of Nick Brown, a graduate student in applied positive psychology, who felt that the paper's mathematical claims underlying the critical positivity ratio were fundamentally flawed. Brown collaborated with physicist Alan Sokal and psychologist Harris Friedman on a re-analysis of the paper's data. They found that Fredrickson and Losada's paper contained "numerous fundamental conceptual and mathematical errors", as did Losada's earlier work on positive psychology, which completely invalidated their claims. In response, American Psychologist formally retracted the mathematical modeling elements of Fredrickson & Losada's paper, including the specific critical positivity ratio of 2.9013, as invalid. The fundamental nature of the mathematical errors, which went unnoticed for years despite the widespread publicity surrounding the critical positivity ratio, contributed to a perception that social psychology as a field lacked scientific soundness and rigorous critical thinking. Sokal later stated: "The main claim made by Fredrickson and Losada is so implausible on its face that some red flags ought to have been raised." 1. Not everything can be solved with science as one as old and experienced as I am can testify. Else my wife would not have passed away of cancer in the middle of her life together with many others who had to struggle with it in their youthfulness. Happiness is therefore not what science alone can help attain and therefore it was appropriate that Martin Seligman changed his theory of Authentic Happiness to emphasize more about the Well Being of a person. Science is an output of the logical mind which I am very familiar with as it was my strength since at a young age. However, I had soon realized that logic and proven facts would not be the answer to say creating good relationships, knowing how to ride a bicycle or even drive fast cars. A kind of flow is required mastering a number of strengths or skill sets if you want to call it in order to create good relationships or perform other amazing feats. If one wants to understand nature like our own bodies as to know how it works, why it feels what it feels and if we can't understand it no matter how much science tries to explain or define it in quantifiable terms or highly controlled experimental conditions etc, it does not mean we can't attain happiness without science. I can equally make the statement that we don't need science or doctors or drugs to help us be healthier. What the world has become is that we need science to validate anything before we can fully trust anything but yet the complexities of mathematics for example in the Losada ratio can deceive many for a time until one with real knowledge and courage, with nothing to lose, begins to challenge what was supposed to be peer-reviewed truth! Guess it makes room for a book like Thinking Fast and Slow to remind us that Thinking does have systematic errors! 2. Yet we need science, the intellectual thoughts and logic to be organized to find a way of solving life's problems and challenges in this world in a systematic way. Admittedly how would I be able to be doing my own research using the internet to better understand or try to participate in solving this life's mystery of happiness if it were not for the sacrifice of many who had use scientifically proven theories and formulas to create the computer and network to link all of us to allow greater access to knowledge? Without science and the knowledge of mathematics, astronomy and propulsion energies, etc man would not be able to fly to the moon or conduct space experiments out of which the benefit of GPS to help us find a friend's home or anywhere that we need to go to quickly is possible today. There are a host of other benefits that could be classified as useful or important to increase the happiness of life in the world I'm sure. 3. Why are we preoccupied with the notion that we either use science or non-science methods to determine happiness? Are there only 2 choices as one is prone to be led to think? How many branches of science are there anyway and must we agree and accept everything every branch of science teaches? By the same token, how many areas of non-science are there? Must we disagree with everything that every area of non-science teaches like wisdom from our grandparents perhaps? I had learned how the world of psychology had started with the first psychological laboratory at Leipzig University, in 1879 by German physician Wilhelm Wundt. From the 1890s until his death in 1939, the Austrian physician Sigmund Freud developed psychoanalysis, which comprised a method of investigating the mind and interpreting experience; a systematized set of theories about human behavior; and a form of psychotherapy to treat psychological or emotional distress, especially unconscious conflict. It seems that psychology started as an introspective investigation of a person's mind where questions are directed to one who would share his/her inner thoughts so that they can be analyzed. It later focused on the discipline of Behaviorism established in the early 20th century by John B. Watson and embraced and extended by Edward Thorndike, Clark L. Hull, Edward C. Tolman, and later B.F. Skinner. Theories of learning emphasized the ways in which people might be predisposed, or conditioned, by their environments to behave in certain ways. Much research consisted of laboratory-based animal experimentation, which was increasing in popularity as physiology grew more sophisticated. Martin Seligman and colleagues discovered that the conditioning of dogs led to outcomes ("learned helplessness") that opposed the predictions of behaviorism. But Skinner's behaviorism did not die, perhaps in part because it generated successful practical applications. I believe the experiments that Martin Seligman challenged when I read his book were related to Pavlovian conditioning on dogs. The fall of Behaviorism model of psychology in the mid 20th century gave way to many branches of psychology. This explains why Sigmund Koch expressed in his writings on 'The Problem of Psychology' that it was hard to justify it to be a separate independent science due to the difficulty of seeing it as one integral discipline and thus declaring in his words "...the futility of seeking theoretical, conceptual or even paradigmatic unification." Here is a website with a list of psychology disciplines numbering to over a hundred! I note that Positive Psychology advocated by Martin Seligman is listed. Also, the third point of my summary seems to be in line with the discovery of a proliferation of the branches of psychology and I like the Humanistic psychology discipline which seems to have the holistic or integrating approach to problem-solving that I had adopted when I started the information business in the 80s. In fact, I have evidence that I must have psychoanalyzed myself to write a webpage many years ago entitled, 'My Optimal Thinking Brain' found here. It was written much earlier before this time of writing when I have now so much more research information into the world of psychology. I have other later journals reflecting my interest in our mind and brain, citing latest books I've read especially of authors I am impressed with such as Daniel Siegel in his book 'Mindsight.' I enjoyed online programs with him, with the benefit of technology, to be able to be in the comfort of my home in Asia to participate in his lectures which he conducts in the USA. I particularly appreciate the interaction I got to be able to pose live questions to the intelligent professor and writer of the mind and the brain! but the realization of Self." Here is the making of the Happy music video above where you could see just a few shots of the Minions who star in the movie 'Despicable Me'. Some video or web links do become invalid over time as discovered later in the above video. An alternative site can be found by clicking here. Click the comments icon above to view more videos that I had made recently which makes me happy watching and hope the same happens to viewers too!